I love me some David Levithan. Will Grayson, Will Grayson is one of the best books out there, in my opinion. I loved Every Day, and Dash and Lily's Book of Dares. The Lover's Dictionary follows suit with what I love about David Levithan -- the creativity and uniqueness in his stories. 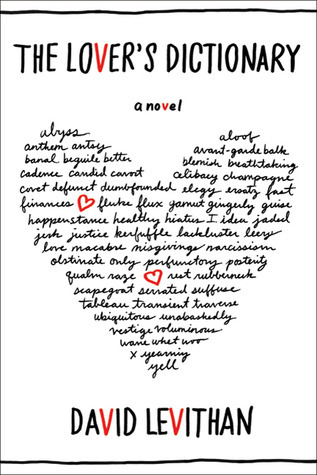 I have been following @loversdiction on Twitter for quite awhile, and I love seeing the periodic posts, which, according to the account profile, "are not from the book, but tease to it." So I found myself with a flight and a copy The Lover's Dictionary, and I expected to think it was the cutest, neatest thing ever. And it wasn't bad. It IS cute. It IS unique. For those of you who don't know, it's a love story composed of dictionary entries. So it starts with "aberrant" and goes all the way through "zenith," and tells a story throughout. My only problem with it was that it was too long. I know this is weird to say for a book that is so physically tiny. I do think it's a cute concept, but I could only make it through to "commonplace" before I started to get bored. Perhaps if there was only one entry per letter, I would like it more and really enjoy the concept. But the multiple words per letter make what should be a cute, short novella a little bit too long. But I'm pretty sure the Twitter account will continue to make me smile. Thanks for the info. I LOVED Dash and Lily's Book of Dares. I will definietly read one of his other books you mentioned before this one.